When more than 400,000 people were left without safe drinking water in Ohio and Michigan this past weekend, Lake Erie's troubling algae blooms received intense scrutiny. Though people were told Monday it was once again safe to drink the water, there's still major concern: harmful algae blooms have been a growing problem in Lake Erie for the last decade, and are a worldwide issue with consequences for the environment and human health. Water treatment tests over the weekend had found unsafe levels of microcystin, a toxin that can be created by cyanobacteria algae blooms, in the Toledo water system that serves Ohioans and some Michiganders. August 1 satellite image courtesy of NASA shows an algae bloom on the western side of Lake Erie. Tim Davis, a harmful algae specialist with the National Oceanic and Atmospheric Administration's Great Lakes Environmental Research Lab, was on the lake Monday. “The water looks like someone painted the surface with green paint,” Davis said, according to NASA. Algae is seen near the City of Toledo water intake crib, Sunday, Aug. 3, 2014, in Lake Erie, about 2.5 miles off the shore of Curtice, Ohio. AP Photo by Haraz N. Ghanbari. Here's what to know about harmful algae blooms. Harmful algae bloom toxins can cause illness in humans. Sometimes, rapid growths of algae can form harmful toxins (though not all algae blooms do). With cyanobacteria algae, the most prevalent is microcystin, which in humans can cause abdominal pain, vomiting and diarrhea, liver inflammation and hemorrhage, pneumonia, dermatitis and potential tumor growth promotion. Humans can be exposed to cyanobacteria toxins through the mouth and skin when swimming in contaminated areas, drinking water, or showering with it. The tests of drinking water in Toledo last weekend found microcsytin levels more than double the World Health Organization's 1.0 ppb threshold, according to the Toledo Blade. The Columbus Dispatch reports 70 people went to hospitals because of health concerns stemming from the toxic water. A member of the Ohio Air National Guard carries a bag of water to a nearby car, Sunday, Aug. 3, 2014, at Woodward High School in Toledo, Ohio. AP Photo by Haraz N. Ghanbari. Algae blooms can be a death sentence for fish and water life. Algae grows organically in freshwater and marine environments. But when conditions are right for it to multiply quickly, blooms can cause fish kills and damage to the rest of the ecosystem. When algae decomposes, it consumes dissolved oxygen in water. If enough oxygen is used, it creates a condition called hypoxia or so-called "dead zones" where fish and other life can't survive. Flickr photo of 2011 Lake Erie algae bloom by Tom Archer. Red tide, a marine species of harmful algae bloom, caused the deaths of thousands of fish, sea turtles and crabs in the Gulf of Mexico last month, according to the Tampa Bay Times. Algae blooms also posed a threat to a delicate ecosystem in a Florida lagoon, killing off sea grass, a manatee food source. The manatee took to eating a toxic form of macro algae, and more than 100 died in about a year, according to a 2013 NPR article. In the Great Lakes, avian botulism has become more common -- more than 80,000 birds have died because of exposure to the neurotoxin in the region since 1999. Scientists believe one of the linked factors is the increased growth of macro algae Cladophora. When the algae decomposes on the lake floor, it creates a ripe environment for the bacterium that produces the toxin. Common fertilizer and farming practices have increased the destructive power of algae blooms. Algae blooms rely on natural warmth and light and can't be linked to just one cause. 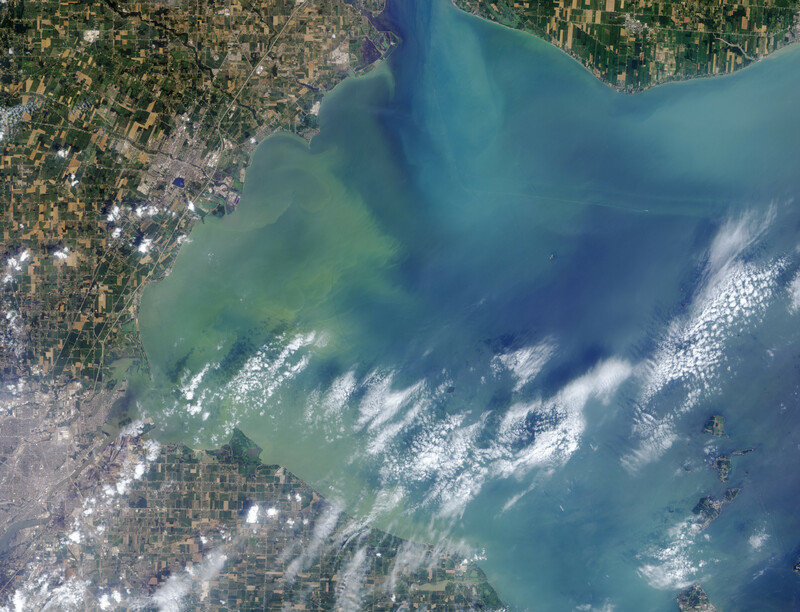 But one of the main factors in the Lake Erie algae blooms is thought to be increased phosphorous -- present in fertilizers (both commercial and manure) for agriculture and lawn maintenance, it enters the water way through runoff, where algae feeds on it. Flickr photo of aerial view of 2009 Lake Erie algae bloom by Tom Archer. Of all the Great Lakes, the Lake Erie basin receives the most phosphorous, 9.8 million pounds per year, and its load comprises 44 percent of the total for the whole lake system. According to the Columbus Dispatch, Ohio lawmakers are considering imposing tighter restrictions for agriculture uses of the harmful fertilizer. Climate change shares part of the blame for the rise of algae blooms -- and may only make them worse. The Environmental Protection Agency notes that more research is needed to understand the role climate change plays in algae blooms, but acknowledges they're likely to get worse. Salinity fluctuation, higher water temperatures, increases in atmospheric carbon dioxide concentration and changes in rainfall are all possible effects of climate change that could lead to better conditions for algae blooms. According to Scientific American, more rain is expected with climate change, which increases runoff and therefore the phosphorous that will enter Lake Erie. Not all Microcystis algae blooms are toxic (and size isn't necessarily an indicator of severity), but according to National Geographic, climate change may be making the toxic strains of bacteria more common.  Chinese military officers clean up a beach covered with blue green algae in Qingdao, eastern China, Thursday, July 3, 2008. China's Olympics nightmare was a vast algae bloom covering one third of the sea where the world's best sailors were to compete. AP Photo by Ng Han Guan. Invasive species have also contributed to the rise of algae blooms in Lake Erie. Since the 1980s, zebra and quagga mussels have spread throughout the Great Lakes, tipping the balance in the lakes' ecosystems. The mussels eat phytoplankton, often increasing water clarity when they first appear. But by selectively consuming non-toxic algae, they reduce competition for the toxic strains in Lake Erie, according to the New York Times. They also do not absorb phosphorus, leaving it for algae to feed on. Decades ago, Lake Erie successfully dealt with its algae bloom problem. But it's come back full force. Before the 1970s, Lake Erie became steadily more and more compromised, mostly by phosphorus, at that point mainly from wastewater treatment plants. The lake was full of algae that piled up high on beaches and needed to be removed with bulldozers. Drinking water had taste and odor problems. In the decades that followed, Canada and the United States signed the Great Lakes Water Quality Agreement and spent billions restoring the lakes, reducing phosphorus loading in Lake Erie by 60 percent. This satellite image provided by NOAA shows the algae bloom on Lake Erie in 2011. AP Photo courtesy of NOAA. But in 1995, algae blooms returned to Lake Erie. The bloom in 2003 lasted a month, and Microcystis blooms have often been a problem since. At 1,920 square feet, the 2011 bloom was three times larger than the second largest ever recorded. The algae bloom last year caused a scare in a small Ohio town, when the Carroll Gardens water treatment plant found microcystin levels more than 3 times the acceptable level. It's not just Ohio: algae blooms are a national and global problem. In 2008, NOAA pegged the economic damage of algae blooms across the country at more than $100 million in today's dollars, with costs adding up for public health, coastal monitoring and management, and losses for fishing and the tourism industries. An EPA survey found microcystin in 30 percent of lakes across the country. Cyanobacteria harmful algae blooms "caused human illness, animal mortalities, and adverse ecosystem and economic impacts in the United States and worldwide, as well as human mortalities in some other nations," according to a 2008 federal report. In China, huge mats of algae are a yearly occurrence in the coastal city of Qingdao -- last year , the Yellow Sea bloom was spread over an area larger than Connecticut, according to The New York Times, and cleanup efforts cleared 20,000 tons of the algae. While not toxic to humans, the algae blooms, which were first reported in 2007, are destructive to marine life. 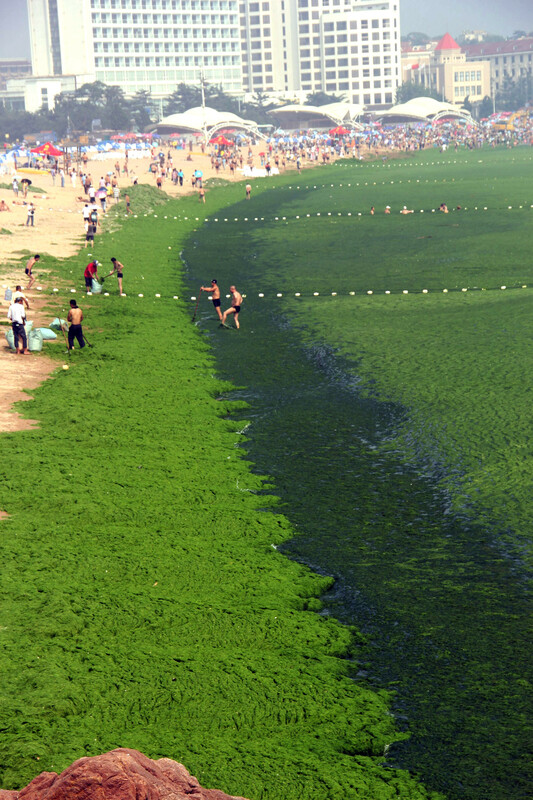 An algae covered public beach in Qingdao, northeast China's Shandong province on July 4, 2013. STR/AFP/Getty Images. Scientists writing in a paper published in the Polish Journal of Environmental Studies said increasing cyanobacteria blooms are "one of the most serious risks to human health in the 21st century." On the coast of Brittany in France, algae piles up each year, releasing toxic gasses when it decomposes. Its increase has been tied to the release of nitrates from pig and poultry farming, according to the Telegraph. In 2009, a horse died from exposure to the toxic algae and his rider suffered symptoms. A man who worked emptying algae bins also died in 2009, though courts have not ruled on his cause of death, according to the Associated Press. Dogs and wild boars have also been found dead in the area. A town employee walks in a mire of algae, on the beach at Saint-Michel-en-Greve, Brittany, France, in this file photo dated Thursday, Aug. 20, 2009. AP Photo by David Vincent. Scientists are studying algae blooms and have made recommendations to limit phosphorus, the pollutant in the Lake Erie bloom, though lawmakers and regulators may need to catch up -- the Ohio EPA hasn't even required water treatment facilities to test for microcystin. This year's Lake Erie bloom isn't necessarily worse than years past, it just happened to be in a location that had more of a direct impact on humans, NOAA scientist Tim Davis pointed out. But seeing possible consequences may spark some change, or so hopes U.S. Sen. Sherrod Brown (D-Ohio). The City of Toledo water intake crib is surrounded by algae, Sunday, Aug. 3, 2014, in Lake Erie, about 2.5 miles off the shore of Curtice, Ohio. AP Photo by Haraz N. Ghanbari.